Highlead GC20618-1DZA direct drive heavy duty walking foot industrial sewing machine with large hook on a vertical axis, automatic thread trimmer and time saving production aids including a new shorter thread end trimming mechanism. A new shorter thread trimming mechanism is available which can reduce the visible thread end, left after automatic thread trimming, from the usual 7mm-12mm to a shorter length of approximately 5mm. This can be useful in improving the finish of the sewn stitch line and may help reduce the need to manually thread snip these areas after sewing. With Direct Drive; power is transmitted directly from the motor along the drive shaft of the sewing machine, reducing power usage by up-to 40%* and lowing noise levels*. Direct Drive also eliminates the need for a motor drive belt offering improved safety with no exposed belts or additional belt guards. A dual electromagnetic thread tension system helps to produce a smooth balanced stitch without excess thread or skip stitching and at the push of a button you can switch between 2 different thread tension settings, without the need to manually adjust the tension dials. 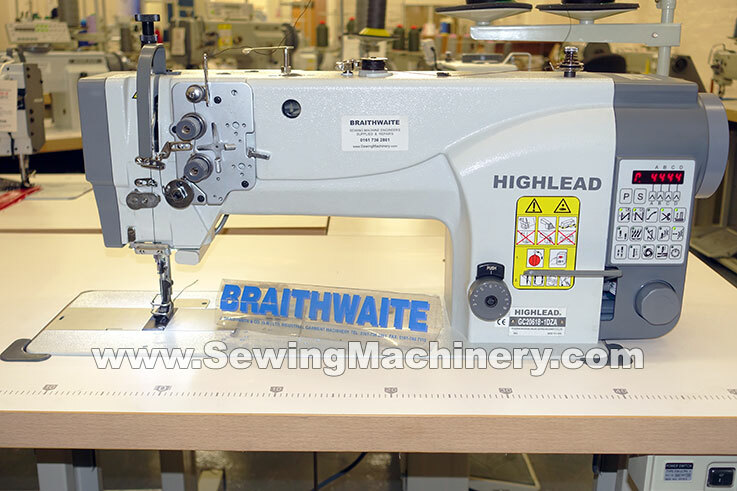 A thread hold control device is fitted above the needle bar area, which automatically activates when you start sewing, to shorten the needle thread length; thereby reducing the "birds-nest" effect and the thread end visible at the start point of sewn stitches. This can also help to reduce the need to manually thread snip these areas. The sewing arm is approximately 15% Longer & Higher* allowing additional sewing clearance, to the right of the needle, for larger heavy items. An electronic jog dial allows precise feeding and needle positioning for ultra slow and minute rotational control of the stitching process. 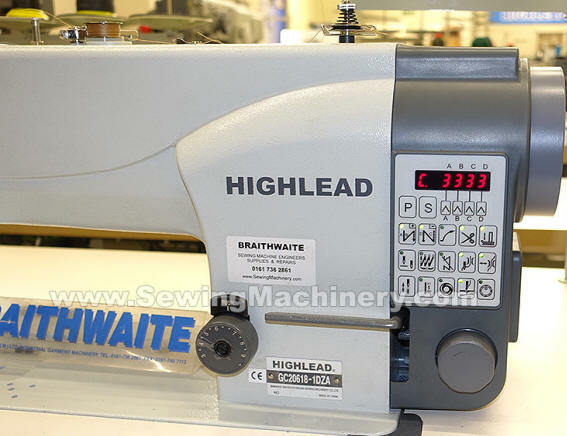 The Highlead GC20618-1DZA is a feature packed heavy duty sewing machine and as well as direct drive, triple feeding system (bottom feed, needle feed & walking foot) and automatic thread trimming; it comes equipped as standard with programmable Electro-pneumatic auto reverse, auto back-tack, knuckle quick reverse, Electro-pneumatic auto foot lifter, built in push-button control panel and LED needle area light. No "birds-nest" needle thread hold device. *when compared with a conventional model.